Zip is a archive file format that is used to store compress data. We can store any number of files with this compression technique. This format was originally created in 1989 by Phil Katz. 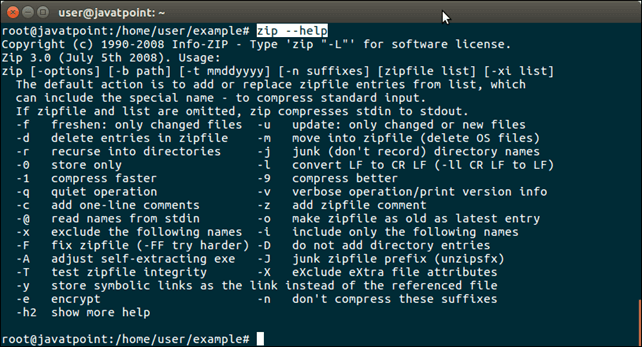 In this tutorial, we will zip and unzip directory using Ubuntu terminal. First see, number of directories present in current directory. Currently, we have a javatpoint directory that we will zip in next step. Use the following command to ZIP javatpoint directory. See again, number of directories present in current directory. Here, now we have one more directory that is created as zip file. Like zip, we can unzip zipped directory. See, as we did below. Use following command to unzip zipped directory. zip command has various flags to set attributes for zip file. For more about these flags, ask for help.